Hi, i would like too say i use all lucas products and they are great. 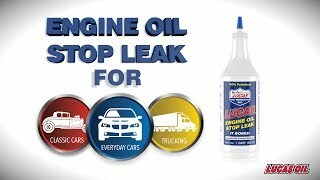 There is one product that blew my mind and it&apos;s the lucas oil stop leak. i put this bottle in my pickup that leaked a gallon a day. When i took it for a ride and came back i put a piece of cardboard down to see if it stopped and its totally dry no leaks. i had to check the dipstick to make sure there was oil in the engine so im very happy and would highly recommend this too anyone.